Tiramisu Truffles are smooth white chocolate truffles flavored with mascarpone cheese and coffee to mimic the taste of the classic tiramisu dessert. You can also add a dash of rum extract or brandy if you want to make these truffles really authentic. Mascarpone is a mild, soft Italian cheese that is often used in desserts thanks to its rich, creamy texture. If you cannot find it, you can substitute full-fat cream cheese instead, but the flavor and texture will be slightly different. Carefully melt the white chocolate in the microwave, using half-power and stirring it after every 30 seconds. White chocolate scorches easily, so it's best to heat it slowly and gently. Stop heating when there are still a few unmelted pieces remaining, and let the residual heat of the melted white chocolate melt the remaining pieces. Combine 1/2 tsp of instant coffee with 1/2 tsp of water in a small bowl or cup, and stir until the coffee dissolves. Once the white chocolate is melted and smooth, stir in the mascarpone cheese and the coffee until there are no lumps remaining. Taste the mixture, and if you would like a stronger coffee flavor, dissolve the remaining 1/2 tsp of instant coffee in another 1/2 tsp of water and add it to the white chocolate. Press a layer of cling wrap on top of the white chocolate and refrigerate it until firm enough to scoop, about 1-2 hours. When the truffle mixture has firmed up, use a teaspoon or a small candy scoop to form it into 1-inch balls on a foil-lined baking sheet. If it's too hard to roll, let it sit on the counter at room temperature until it softens a bit. If it sticks to your palms, coat them lightly in cocoa powder occasionally. Melt the chocolate candy coating in the microwave. Use forks or dipping tools to dip a truffle in the melted coating, then let the excess drip back into the bowl. Place the dipped truffle back on the foil-covered baking sheet and repeat until all of the truffles are dipped. Tiramisu is traditionally served with a dusting of cocoa powder on top, so place the unsweetened cocoa in a small strainer and lightly sprinkle the tops of the truffles with cocoa powder. 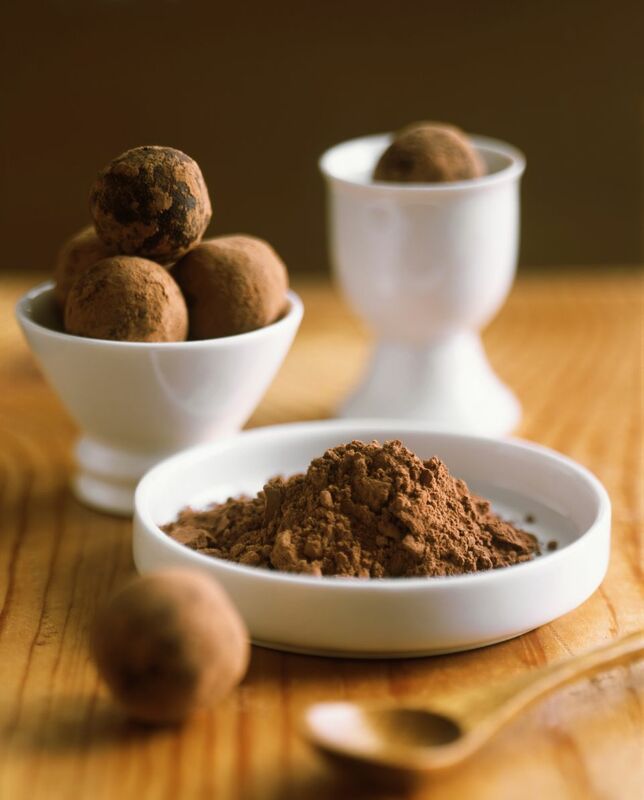 Tiramisu Truffles can be stored in an airtight container in the refrigerator for up to two weeks. For best taste and texture, bring them to room temperature before serving.